Dubai Customs organized its annual IP celebration on the occasion of the World Intellectual Property Day 2018 at Mariott Hotel in the presence of Ahmed Mahboob Musabih, Director of Dubai Customs, Dr. Amna Al-Dahhak Al-Shamsi, Assistant Undersecretary for the Welfare and Activities Sector in the Ministry of Education, The Consul-General of the State of Kuwait in Dubai and the Northern Emirates, Thiab Al-Rashidi, Deputy Consul General of Korea Kim Yung Su, Indian Commercial Consul Binkaj Bukdkahi, Egyptian Commercial Representative Dr Yunan Edward, Canadian Trade Commissioner Kite Stackey, and a number of trademark owners and government officials. In his welcome note, Director of Dubai Customs said:” I am happy to welcome you here to celebrate together the World Intellectual Property Day which gains particular importance in the Year of Zayed. The Late Sheikh Zayed laid the solid foundations of this nations and helped it to go on an equal footing with the modern world”. Musabih added: “The UAE joined the Intellectual Property Organization in 1975. When it comes to encouraging innovation and creativity, we are amongst the leading nations. Our wise leadership has always nurtured creative ideas and supported talents in fulfilment of a future vision of leading the 4th industrial revolution”. “With this in mind we have always protected intellectual property rights. This is a strict prerequisite to any development project. We work hard to combat counterfeiting and prevent fake products from entering the country. With this in mind we always cooperate with trademark owners. A total of 10,281 trademarks have been registered in the UAE in 2017”. Director of Dubai Customs pointed out that there were 263 seizures of IP infringing items in 2017, worth up to Dh 62.5 million compared to 218 seizures in 2016. The IPR Department has organized 70 awareness campaigns and initiatives throughout the year. He said:” We have arranged 70 awareness events that targeted different segments of society in 2017, and 18 events in the first quarter of 2018. We target the younger generations to raise their awareness around the hazards of counterfeit products. Our efforts in this side include the launch of the IP Award for Schools and Universities”. A total of 165,824 students from 172 schools and 30 universities have participated in the award since its launch up to the end of 2017. We are happy today to award the schools and universities that win the 2017-2018 award.Dubai Customs sponsors the Children’s International Film Festival and award winners in films on IPR. Mahbooba Baqer, Head of Awareness and Education Section in the IPR Department made a speech on behalf of WIPO Director General Francis Gurry, followed by a film on the achievements of the IPR Department. 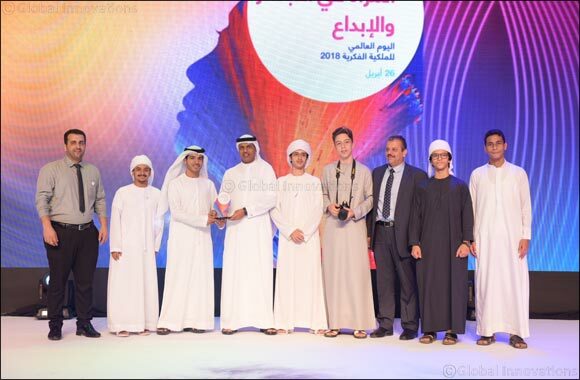 Director of Dubai Customs awarded the winner schools and universities. Ajman University won the universities category, Al Khalidia School won the government school category and JSS won the private school category. Musabih also honoured Dubai Customs partners in IP. Dr. Amna Al-Dahhak Al-Shamsi, Assistant Undersecretary for the Welfare and Activities Sector in the Ministry of Education, Aisha Sabeel Al Madani, from KHDA, and Fatima Abdulla, document testing expert in Dubai Police. Musabih also awarded a number of female managers and employees in the Department in line with this year’s theme that highlights the great role women play in life. Dr. Shaikha Al Ghafiri, Director of Dubai Customs' Training Centre, Ekhlas Al Mutawa, Director of Audit Department, Farida Al Muaini, Director of Customs Valuation Department, Narmin Ahmad Ali Issa, Director of Legal Affairs Department were among the honoured.